Specialising on producing the finest quality yacht masts, wooden oars and spars we pride ourselves on a personal, tailored service, and maintain a close and constant contact with our customers. From the critical choice of timber to the final stages of smoothing and varnishing, a Collars product has over seventy years of experience and expertise put into it, making it the number one choice time and time again. It was in one of the old Oxford University boathouses on the edge of the Thames, that Frank Collar started the business.The year was 1932 and with very few tools and no electricity supply, repairs to the college oars kept the new business busy. With Frank being a keen rower, he could see the potential for business not only with Oxford University , but also other colleges. By the time the Second World War broke out, the Collar reputation was sufficiently well established for Frank to secure a contract with the Air Ministry, to make oars for aircraft lifeboats. 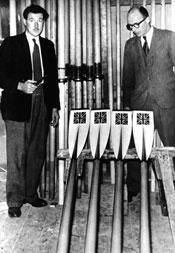 Gradually the business built up so much that F Collar Ltd supplied oars for all the Olympic Games between 1952 and 1984, making the name instantly synonymous with premium quality racing oars. Collar's wooden oars and spars have gone all over the world. Chay Blythe and John Ridgway used them for their Atlantic crossing. Countries such as New Zealand, Canada, Australia and of course Great Britain, have taken them into competition. One retailer in Maine, USA proudly advertises their stock as 'hand crafted in England'! With many parallels between wodden rowing oars and yacht spars, namely the use of the best quality Sitka Spruce, it only a matter of time before this market found Collars. Enterprise and Wayfarer dinghies were the first in a long line of classes that relied on Collars to produce spars after the post-war boom in small dinghies and family boats. With the introduction of Carbon Fibre rowing oars in the mid '80's, the demand for wooden oars declined leaving Collars to focus their attention on yacht spars. Today this accounts for 85% of the business and with the move to larger premises in 2002, Collars capacity has increased to match the revival in the classic yacht market. Usually the initial shaping is done by machine but one craftsman does the final work with traditional hand tools, so an interested customer can actually meet the person who was responsible for the finished mast. This relationship is particularly important with one-off jobs that may require frequent consultation with the customer. Although machines have made the job lighter and quicker for modern oar and spar makers, there is still a tremendous amount of skilled hand work involved. From the critical choice of timber to final stages of smoothing and varnishing, a Collars product has over sixty years, three generations and several working lifetimes of experience and expertise poured into it.